Hiddush - New polling reaffirms Hiddush finding. Homepage / Hiddush News / Hiddush Positions / New polling reaffirms Hiddush finding. 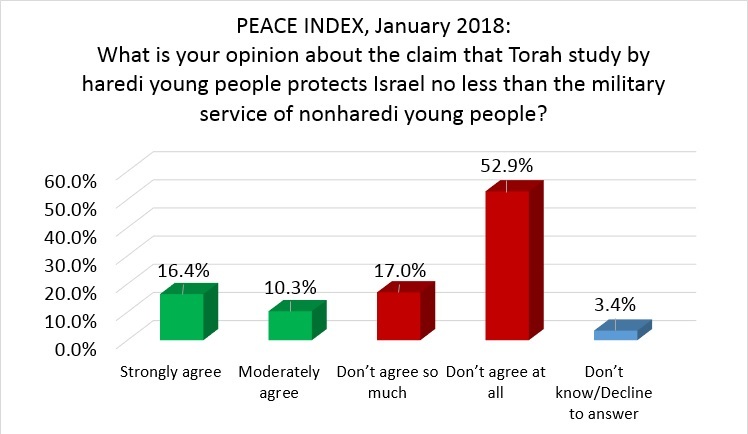 The January 2018 issue of the monthly Peace Index, published jointly by Tel Aviv University and the Israel Democracy Institute, touches upon key confrontation points along the spectrum of religion-state issues on the public's and political class's minds at this time. The January 2018 Peace Index reaffirms both Hiddush's findings and our view that these issues hold a major key to understanding the complex nature of Israeli politics and the way out of this embarrassing and harmful anomaly, which is to overcome the great void between the Israeli public's will and the actions of Israel's politicians. Only a minority of the Jewish public (27%) prefers a government that includes the haredi parties, while the majority (53%) prefers a government without them. The Peace Index distinguishes between two demographic groups among Israel's "traditional" Jewish population, which Hiddush has repeatedly emphasized the critical distinction between [as defined by the Central Bureau of Statistics]: 1) "traditional, close to religion, and 2) "traditional, not so close to religion." It is important to realize that many among the second group share the secular public's views on policies in terms of the clash of religion and state. It is a sad fact that Israel's political "powers that be" are self-righteous (without any basis in reality) when they claim to be the genuine representatives of the public's will on matters of religion and state. The opposite is true, as is borne out in the Peace Index, as well as in Hiddush's repeated polling! The overwhelming majority of the public wants a government coalition without the Haredi parties. The public wants them out of governmental positions!